T-POT is a 2 inch puzzle from Rocky Chiaro. The object is to remove the lid. I bought this puzzle from Rocky at the International Puzzle Party three weeks ago. It's very expensive, but I consider it a gem. Rocky's a retired machinist. He's 83. 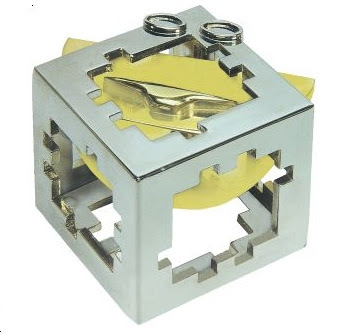 If you have a good mechanical puzzle collection, you should get this. Click here to go to Rocky's homepage. Long time 'followers' of this blog may remember Quares. 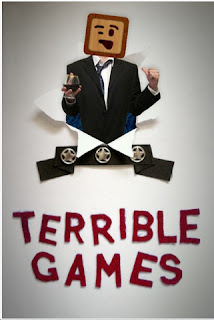 I reviewed it October of last year. It's a point scoring puzzle app. Guillermo Zafra is behind Quares. 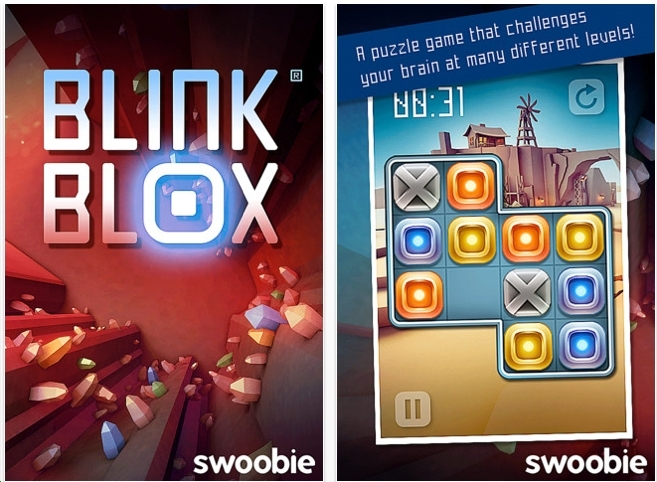 He recently contacted me about his new puzzle app for toddlers: Think-N-Link. The puzzle is all images. Look at the enclosed image and you get the idea. Click here to see a 1 minute demo. The object of Arrow Point is to place 16 tiles in the middle of the grid so that the numbered squares on the perimeter have exactly that many number of arrows pointing at them. Look at the first image. Notice the tiles all have 1 arrow and they are orthogonal. Now look at the second image. The tiles have two arrows and they are orthogonal and diagonal. Tough! Look at the squares in the perimeter. See the yellow one that says 2/3. The top number indicates that many arrows should point to it. The bottom number indicates that 3 arrows are actually pointing at it. Because that's not kosher, the square is yellow. Green is good! Richard Rice is the author of Arrow Point. 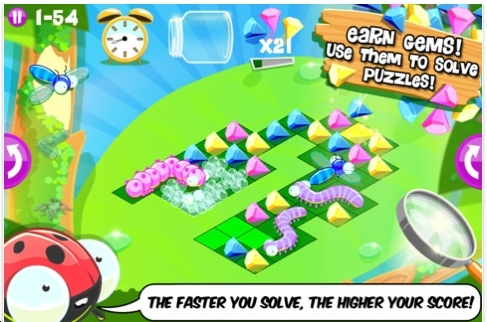 According to him, any time you open an easy, medium, hard or expert level, a brand new puzzle will be created. Therefore: infinite number of puzzle levels. I've played Arrow Point for about 1.5 hours. I have not succeeded in solving an expert level - yet. Arrow Point is now free through September 3rd. 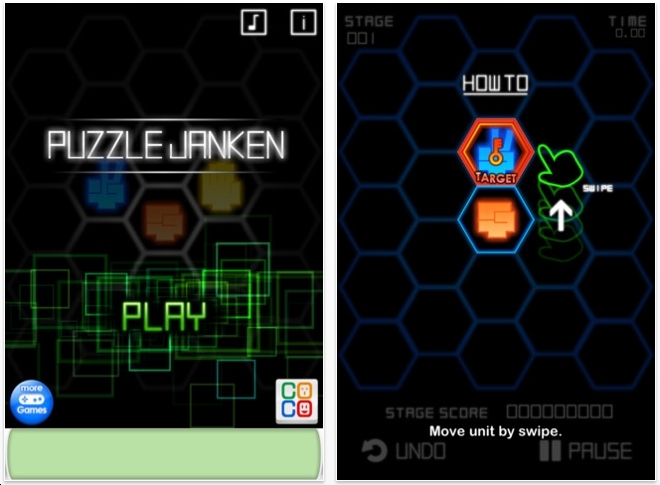 PuzzleJanken is really Rock, Paper, Scissors. Notice the Peace sign? That's scissors. You get the idea. You are given a grid of symbols and must eliminate all the figures. Note: if 2 rocks are next to each other, they may cancel each other. Except for the end. If the end target is a hand - paper - then it cannot be canceled with another hand. PuzzleJanken has 60 levels. I've solved all 60 of them. It's and fun and mildly challenging. The price is free, so definitely try it. 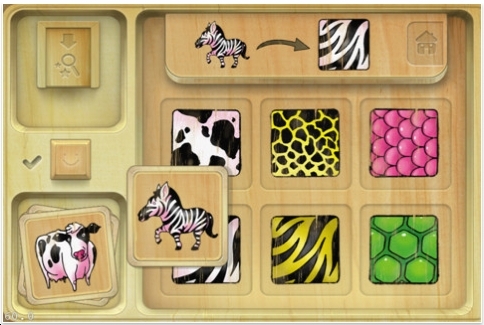 Gone Buggy is a packing puzzle consisting of mostly 1, 2 & 4 sized tiles in the shapes of bugs. The objective is to fit them into the grid. 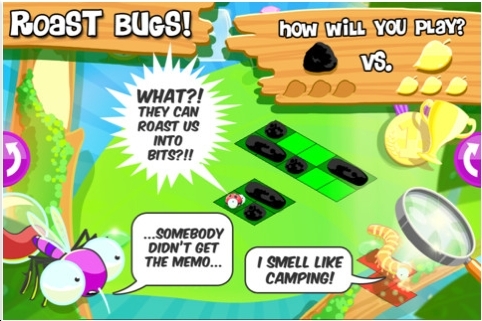 If you can't do it, then you can fry a bug into smaller bits with the magnifying glass. 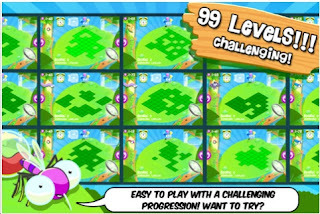 As you can see, there are 99 levels. 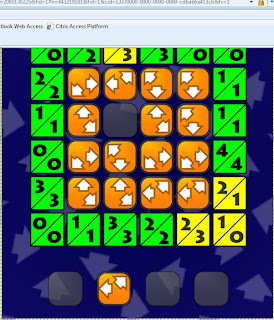 I've played Gone Buggy for about 4 hours and solved 44 levels. I normally eschew this type of 'fill the tray with pieces' puzzle. Gone Buggy has a certain flair. Perhaps it's the fact that it gives you 1 piece at a time. I think it's fun. Try the free version. 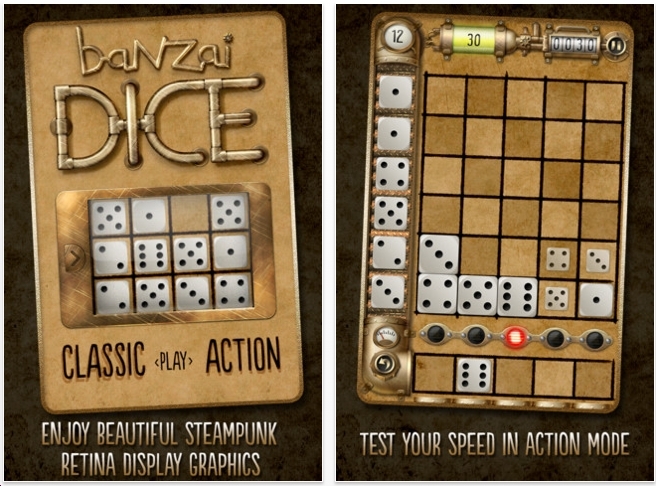 I wrote about Banzai Dice about 2 months ago. 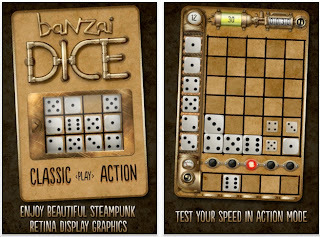 Banzai Dice is a point scoring puzzle app. Figuring out a strategy is tricky. Good luck. 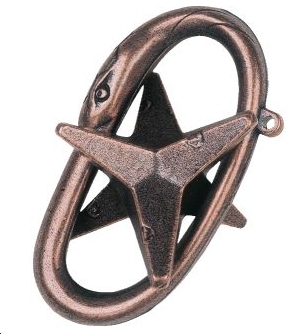 Cast O'Gear comes from Oskar van Deventer. I bought Oskar's first version of this which was all plastic made by George Miller. 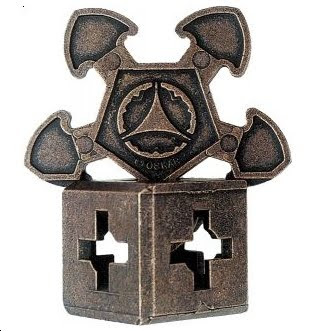 The object is to swivel the piece inside the cube, then turn the big piece over to another face. Keep doing this until you find the exit. Naturally, I had to buy the metal version too. The object of Lasers Free is to move the laser nodes around so that the beams strike all of the white diamonds. There are more than 500 levels, so this will keep you busy for a while. I've done about 25 levels. 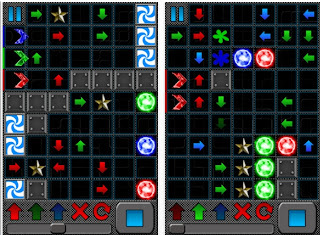 If you get into this type of puzzle, you can create your own puzzle levels. 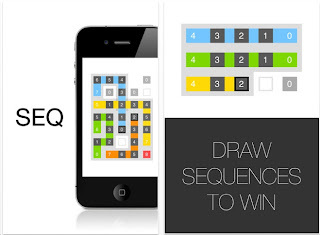 SEQ comes from Thomas Castel and is an interesting puzzle app! The object is to draw paths from each colored number to any of the zeros on the grid. Here's where it gets interesting: some squares can/must be used by both sequences. And the key is figuring them all out. SEQ has 160 levels: I've done 117 levels so far. I've been stuck for a few days now. Definitely worth your time. SEQ could land on the list of Best Puzzle Apps of 2012. Update August 31: I solved all of the levels. SEQ is absolutely fun. If you like this, you'll also like Numeric Paranoia. 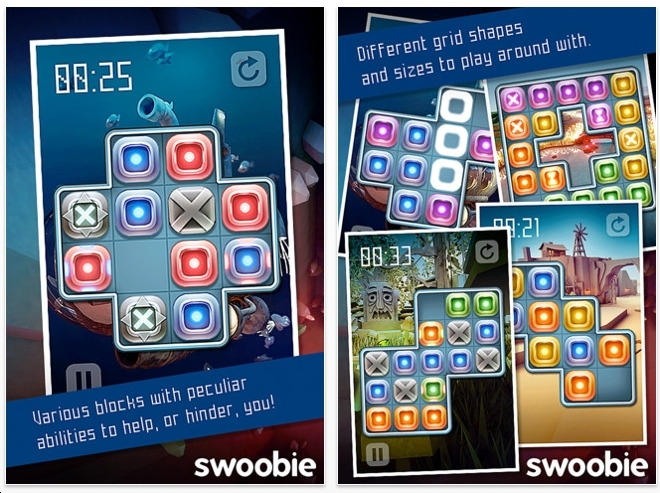 According to Benjamin Dicken, the author, TYL is "the most AMAZING PUZZLE APP YOU WILL EVER PLAY!" I'm not sure I'd agree with that statement, but I will say this: TYL is a fun puzzle app. The object is to get all the colors to be the same. Jumping off a square will make that square change its color. 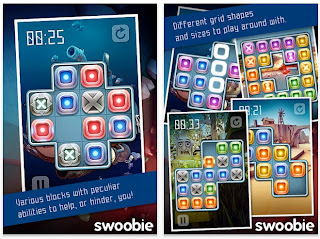 The easier puzzles: each square will toggle their colors in this order: red, blue, green. 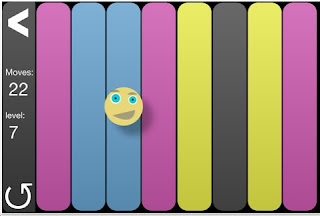 The harder puzzles: each square or rectangle will toggle in this order: cyan, magenta, yellow and black. 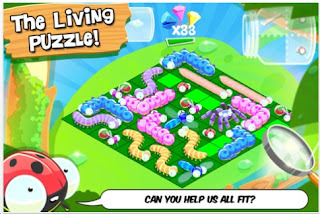 The easier puzzles have 21 levels and the harder puzzles have 18 levels. I've solved them all. 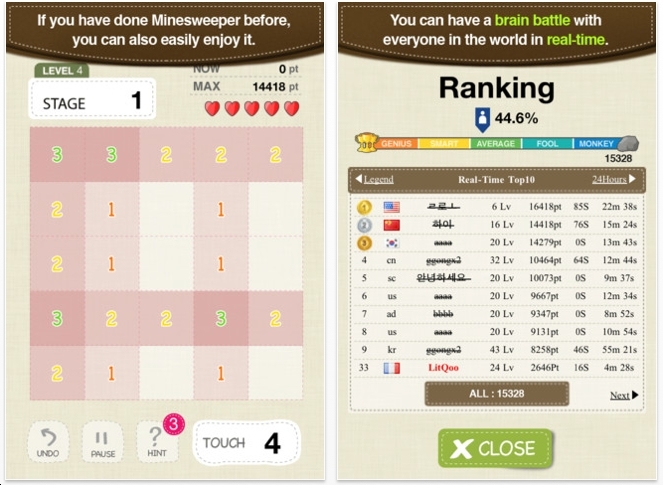 TYL does not make it onto the list of Best Puzzle Apps of 2012. But it's fun, fast and mildly challenging. I did struggle on 4 or 5 levels. 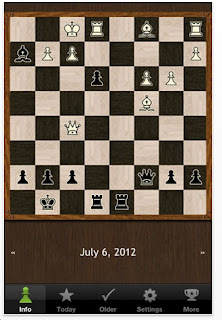 For other levels, I solved them well under the given number of moves. TYL is worth your time and hey, it's free. This is a classic take-apart puzzle. Great as a gift for kids. Each puzzle has a time limit. 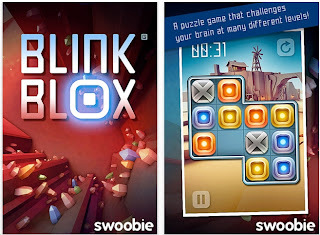 Does Blink Blox make it onto the list of Best Puzzle Apps of 2012. Probably not. But it's fun. The object of Neon Snake is to slide the green snake to the big green circle. 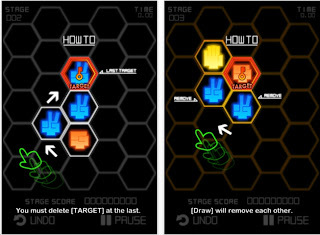 Neon Snake reminds us of Wriggle and Snake Slider. There are 68 levels. I've done all of them, except for level 21 which I'm convinced is impossible. Otherwise, I think this set of puzzles is a bit too easy. The object of CrossCross Puzzle is to make each square get to zero. Tap on a square and all the squares in that row and column will decrease by 1. I've seen this type of puzzle before. 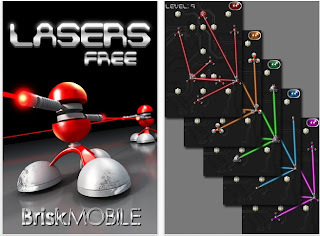 CrossCross has 168 free levels. Of those, I've done 84 of them. You might think that the solution is to automatically tap the highest numbers. Not necessarily. 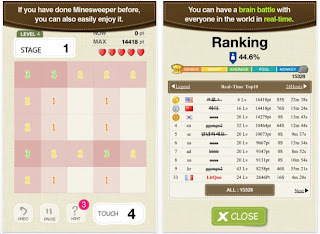 CrossCross Puzzle does not make the list of Best Puzzle Apps of 2012, but hey, it's free and fun. I just got back from attending the annual International Puzzle Party. It was held in nearby Washington D.C. There were about 400 puzzlers and of course lots of mechanical puzzles. There were some fabulous new designs. The International Puzzle Party is by invitation only to serious puzzle people. If you're interested in attending this event in the future, let me know. 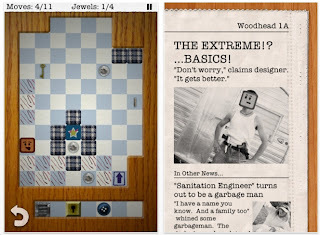 Matthew Klundt, of Terrible Games, recently sent me a promo code to play-test his puzzle app Woodhead. 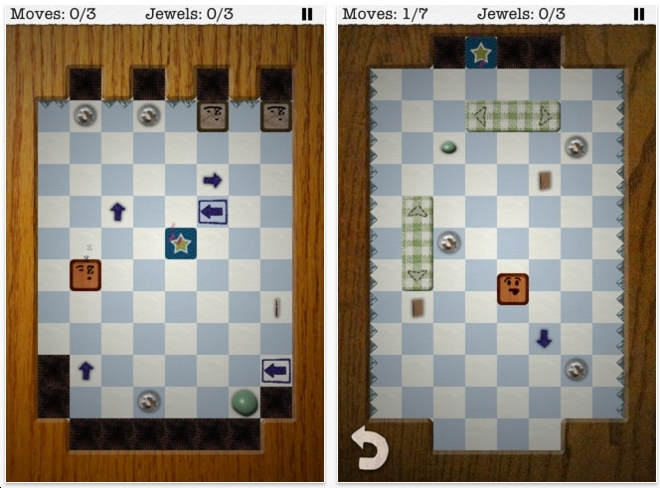 Woodhead is a sliding tiles puzzle that uses the principle of: a tile will slide all the way until it hits a wall or solid object. We've seen several dozen of these types of puzzles before. A favorite is Blockhouse. Woodhead has some old and new, interesting elements. 1. The object is to swipe Woodhead to the exit and picking up jewels first. Nothing new here. 2. On some levels, Woodhead must first pick up a key to unlock a door. 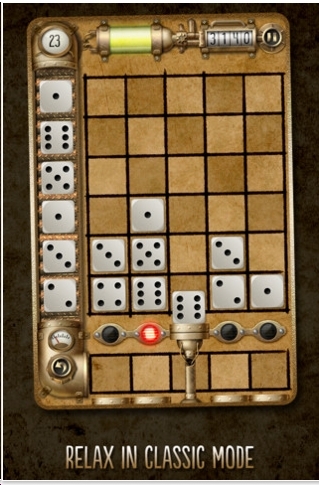 We've seen this before - recently with Snake Slider - but that's not a sliding tile puzzle. 3. 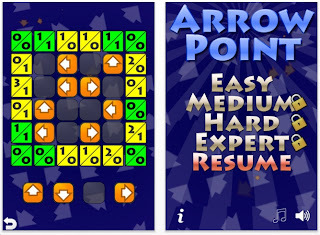 The player must pick up blocks and pick up arrows and place them strategically. This I haven't seen before! 4. Spikes: some sections on the walls have deadly spikes. Ouch. 5. 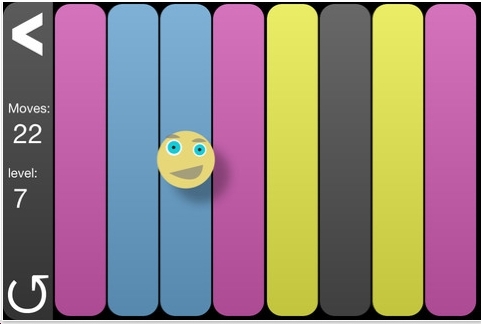 Sliding Bars: these act as room dividers. 6. Some squares can only be traversed once, after that, it's death. Double ouch. 7. Sticky Blobs: these will halt your progress in the middle of the grid. Also, Sticky Blogs can be collected and placed anywhere on the grid. 8. Co-Woodheads will swipe travel together. Unless you tap one of them to sleep; he'll stay put. It's okay for one of the Woodheads to die. Life can be unfair. "Eccentric Street Wanderer Getting Increasingly Difficult to Ignore"
"Sandwich: Greatest Invention of All Time"
Woodhead has 55 levels. Of those, I've solved 47 of them. Does Woodhead make it onto the list of Best Puzzle Apps of 2012? Quite possibly. You'll have to visit my blog at the end of December for the award ceremony. It would be great if you could bring the champagne, chocolate, and cash. I first got Cast Heart about 10 years ago. 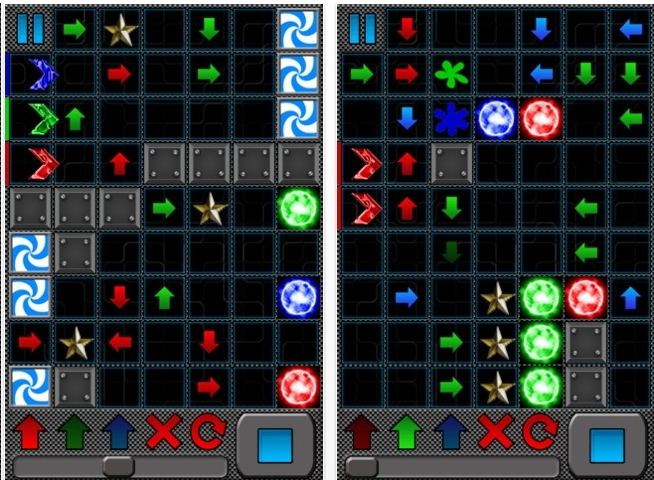 It's one of those few disentanglement puzzles that I really like. Chess Puzzle of the Day comes from Adrian Hanft. 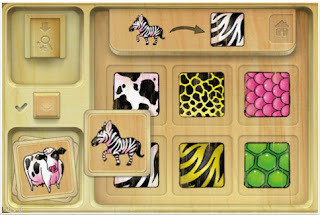 This is a legitimate 'Mate in 2' or 'Mate in 3' puzzle app. If you try to make a wrong move, the program forbids it. Chess Puzzle of the Day is a free puzzle app. Are you a gambler? 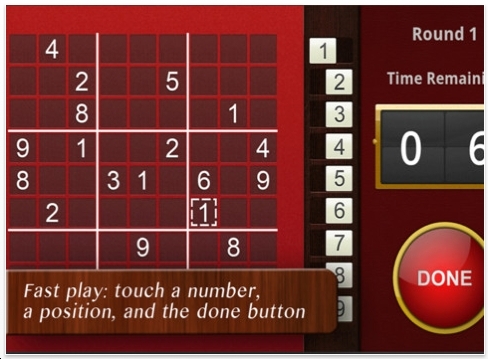 How fast can you do an easy Sudoku? SuDoKuPDQ! comes from Tom Emrich. Practice Mode: you are given 20 seconds to find & fill in a correct number - anywhere on the board. Just 1 number.If you find it in only 5 seconds, then your remaining time - 15 seconds - becomes your score. Each game consists of 5 rounds. The remaining time from each round adds up to your total. After you've practiced this, you'll want to compete with others online who will be given the same 5 boards. 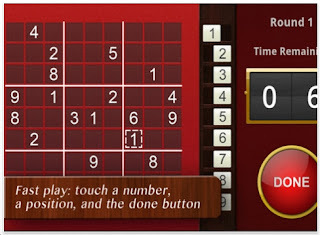 I started doing Sudoku puzzles in 2001 when I attended the International Puzzle Party in Tokyo. It took another 2 or 3 years before the sudoku craze hit the US. Now, sudoku has played itself out. But, if you think you're fast and want to earn some beer money, go for it! 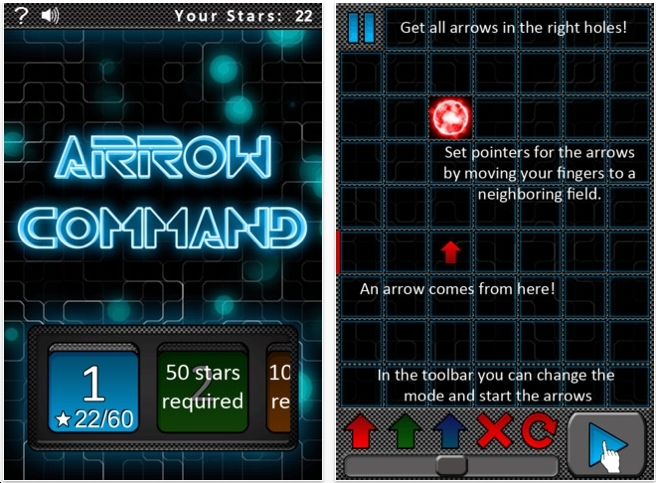 Arrow Command is a set of 120 maze puzzles. The Big Red Arrow must get to the red circle, while picking up stars along the way. You must place little red arrows to guide the Big Arrow home. We've seen this type of puzzle before. Galaxy Express comes to mind. 1. 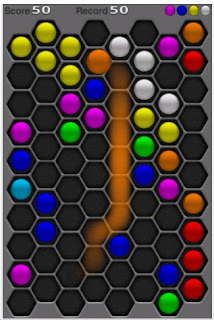 Multiple colored arrows. The very easy levels have just one Big Red Arrow to get to its destination. 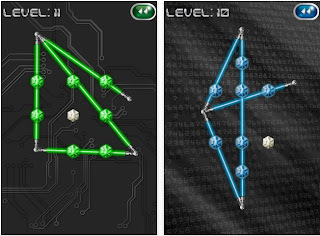 Other levels have blue and green arrows that must get to their respective circles. 2. Wormholes: we've seen this before. 3. Toggling Arrows. Suppose 2 Big Green Arrows both need to go over a square with a green arrow on it. The first Big Green Arrow will change direction accordingly while turning the arrow off for the second Big Green Arrow. However, that second Big Green Arrow turns it back on for a possible third Big Green Arrow. 4. Color Morphing: A Big Blue Arrow can change its color to green if it passes over a green asterisk. Right now, I've solved 80 of the 120 levels. The puzzles get hard! Arrow Command jumps onto the Best Puzzle Apps of 2012 list. The object of Cast Cuby is to swivel and rotate the object through the 6 windows until the correct orientation is achieved and can slide out. I have the metal version, produced by Hanayama. I also have a very large wooden version made by Tom Lensch, who is probably my favorite woodworker. 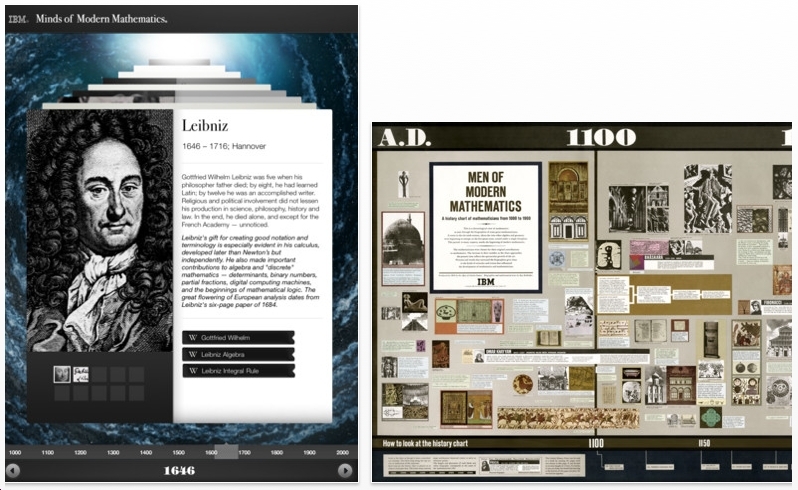 IBM produced this free puzzle app that chronicles the history of mathematics. There's a lot here. 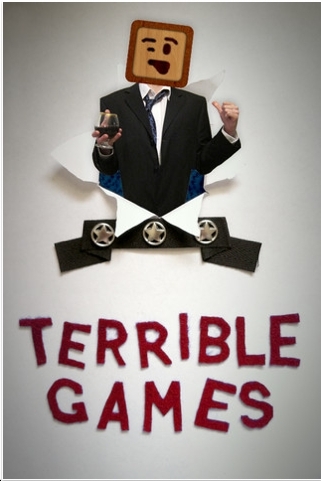 Definitely check out the 9 short films - made ages ago. 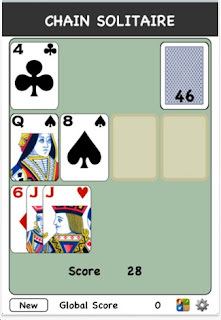 Chain Solitaire is similar to the Uno and Crazy Eights card games. 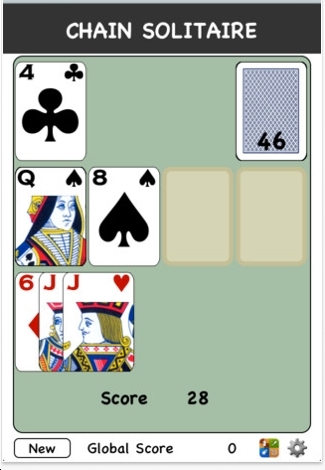 But it's a solitaire version.Try to create a string of cards at the bottom. See the Jack of Hearts? 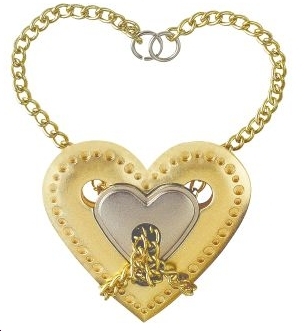 You can place a heart or a Jack on it. There are 4 columns as holding cells. The free version only allows 2 holding cells. Chain Solitaire is a very fast game. I've played it about 15 times. My high score is 368 - on the free version. I'm not sure how many cards that came to though. I've tried to figure out the scoring system - I don't see a pattern. On one game, my first 10 cards gave me a score of 67, while on another game I got 94 for the first 10 cards. Update: the point value is what each card is. Also, I was able to get all 52 cards using just the 2 holding cells. Chain Solitaire does not make it onto the list of best puzzle apps of 2012. But it's entertaining.